Sailors dubbed this tropical seabird as the ‘wide-awake’ bird due to the cacophony of noise produced when large numbers gather at nesting colonies. 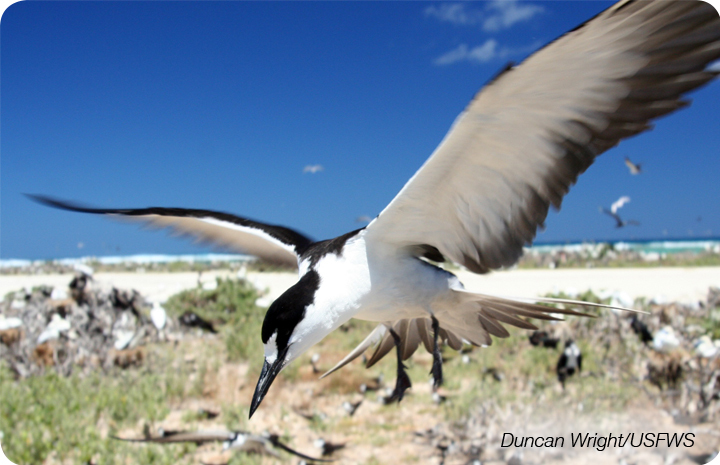 This true seabird wanders tropical oceans for its entire life, only coming to land when nesting. Apart from one of two isolated pairs this species can only be found nesting in Dry Tortugas National Park. Visit between March and June to see them. When John James Audubon visited the Tortugas he noted, “I felt for a moment as if the birds would raise me from the ground, so thick were they all round, and so quick the motion of their wings. Their cries were indeed deafening.” Sadly the Sooty Tern colony in the Tortugas is now just a fraction of what it was when Audubon first witnessed it. Sailors collected the eggs by the thousands to eat and sell and the population suffered as a result.